Like a tank? NEXT LEVEL LADIES’ IDEAL RACERBACK TANK is made of 60% combed ring-spun cotton/40% polyester jersey. Fabric is laundered. Tear away label is good for you to do any activities. Add it to cart when the summer is just around the corner. Another option is NEXT LEVEL LADIES’ JERSEY RACERBACK TANK. More than ten colors are just for in this summer. The fabric is 57% combed ring-spun cotton/38% polyester/5% spandex jersey. So the touch feeling is so nice and it will keep you dry. 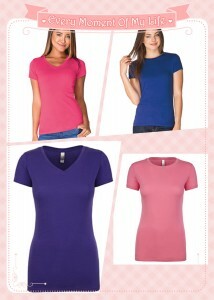 NEXT LEVEL LADIES’ POLY COTTON V NECK TEE is just for the hot summer. It is made of 65% polyester/35% combed ring-spun cotton. Fabric is laundered. Set-in self-fabric V-neck collar with front cover-stich and satin label make this tee comfortable and durable. The corresponding tee is NEXT LEVEL LADIES’ POLY COTTON TEE. It isn’t the V-neck tee. I suppose you will like the set-in self-fabric collar. The last two tees I will introduce to you all are NEXT LEVEL LADIES’ SPORTY V NECK TEE and NEXT LEVEL LADIES’ PERFECT TEE. The former one is made of 100% combed ring-spun cotton so it is really so comfortable to wear. There are nine colors for you to choose. The latter one is also made of 100% combed ring-spun cotton. The Set-in 1×1 baby rib collar with front cover-stitch and satin label are its charming elements.